August 1, 2012 is the 100th anniversary of the first Eagle Scout Board of Review. I am proud to be an Eagle Scout. They are significantly more likely to have worked to solve problems in their community than non-Scouts. Eagle Scouts are 55 percent more likely than non-Scouts to have held a leadership position at their workplace. They are more likely to be active readers. Eagles are 72% more likely to attend live entertainment events than non-Scouts. Eagle Scouts are 100% more likely than non-Scouts to have a designated family meeting place in the event of an emergency. Eagle Scouts are 45% more likely than non-Scouts to agree they always treat people of other religions with respect. Eagle Scouts are 34% more likely than non-Scouts to have donated money to a non-religious institution or charity in the community within the last month. Teaching my children to live a life in service to God, family, community and country was of paramount importance to this parent. Scouting focuses on those core values in an environment of personal achievement, comradery and FUN. 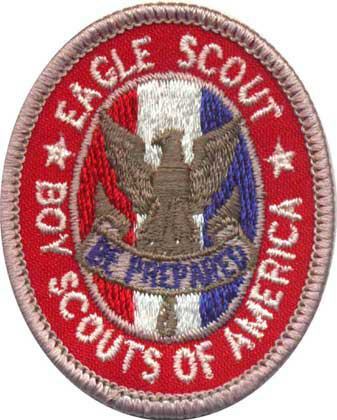 About 2% of all Scouts attain the rank of Eagle. That has trended up recently, with about 5% of all Scouts earning the award in 2008. Of course, Scouting is about outdoor activities … and Scouts are known to be strong environmentalists. They know how to tie knots, go camping and build a fire. Don’t think for a moment that becoming an Eagle is about those things. Learning outdoor skills is just one of the methods used by Scouting to build knowledge and leadership in young men. However, those skills are not the key result of the program. My sons are both Eagle Scouts, and it’s had an important impact on their lives. For one example, both Michael and Christopher got their first jobs as a result of their Scouting experience. Christopher actually learned of a job opportunity with LA County while leading a Scout outing. He got the job, and he’s been promoted by the County several times since; he’s currently a Recreation Supervisor and in charge of 12 natural areas in northern LA County. The cloth badge is sewn on the shirt; the medal can be worn in its place on more formal occasions. Once a boy turns 18, he no longer wears the badge or medal on his uniform. Michael didn’t know Scouting was important to his job with Rocketdyne until one day at lunch. Some co-workers were talking about what they would do if they were washed overboard at sea (Note: rocket scientists often have odd conversations). One of his peers calmly related that he would inflate his clothing – a technique learned by all Eagles as they complete the Swimming merit badge. All of Michael’s peers were amazed to learn that everyone at the table knew the technique … and, further, all were Eagle Scouts. Apparently a degree in engineering from a prestigious university was only one thing recruiters were looking for! 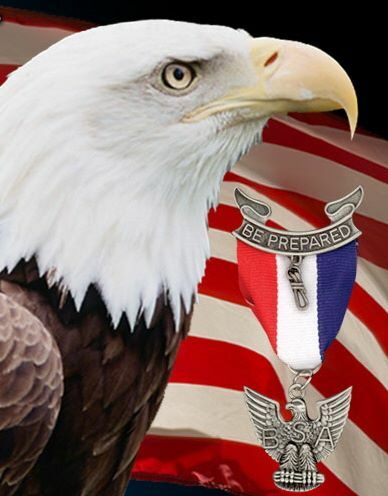 To become an Eagle Scout, each young man must complete over 300 separate requirements. They must earn 21 different merit badges, and complete the requirements to the satisfaction of an adult expert in that field. They must demonstrate leadership by planning, inspiring others, and working with them to complete a service project of benefit to their community, church or school. On six different occasions, they must stand before a board of review made up of community leaders, and demonstrate the Scouting spirit and leadership skills required to wear the different rank badges they must earn on the trail to the Eagle badge. Eagle Scouts will know how to camp – and they’ll know what to do in a nuclear emergency, too. They’ll have written a letter to their congressman. They’ll know how to take care of money. They’ll know first aid for a broken arm and a cut finger. They’ll know the best knot to tie down a friend’s suitcase on a roof rack, too. Once a young man has earned the award, they are an Eagle Scout for life. 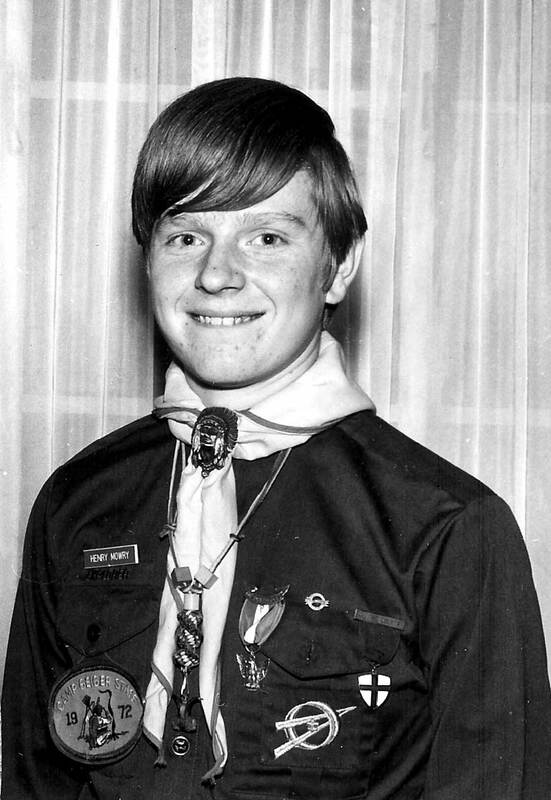 I earned my Eagle in 1972 while in Troop 58, Maitland, MO. I earned merit badges in Salesmanship and Journalism, which proved to be directly relevant to my success in my chosen career. My Eagle Scout service project was developed in conjunction with the Graham Community Betterment Association in Graham, MO. I actually assigned the street numbers to all of the buildings in Graham, and communicated their new street addresses to each resident and business owner in Graham (population 213!). I know two keys to my success were my Scoutmasters, Eddie Hillman and Franklin Hardy. Most important, however, were my Mother and Father. Dad drove me to Scout meetings every Tuesday night. Mom helped make sure I got the requirements done — I distinctly remember some gentle, uh, encouragement, to get my Eagle Scout service project done. They got me there, and I am an Eagle Scout. Here I am at the Pony Express Council Eagle Dinner in 1972. I’m wearing the Explorer uniform of the Camp Geiger Staff, which I proudly served on in 1972 and 1973.
ps did you get a scout centennial silver dollar? Thank you. No, I haven’t seen the Scout Centennial dollar. Hmmmmmm.